The first rule of Button Club is: You do not talk about Button Club. The second rule of Button Club is: Actually, scratch that. Unlike the members of Fight Club, the 30 or so members of Vermont's Verd Mont Button Club delight in talking about their group and hobby. And, when it comes to clothing buttons, you'd be amazed by how much there is to discuss. That's how Ed and Amy Larson feel, anyway. The Vermont couple are longtime leading members of the VMBC; she's the club president, he the treasurer. 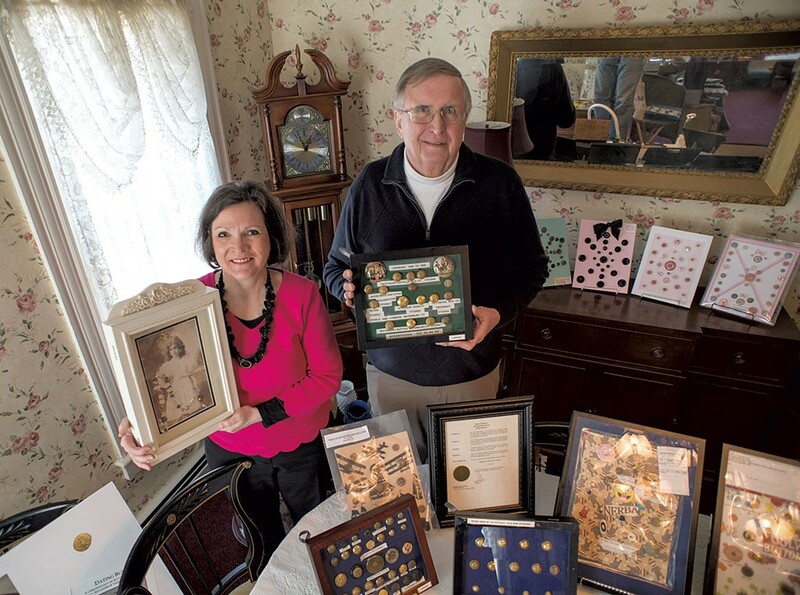 The button club celebrates its 40th anniversary this Saturday, April 13, with an exhibition at Shelburne United Methodist Church. That same day has been declared Verd Mont Button Club Day statewide by proclamation of Gov. Phil Scott. 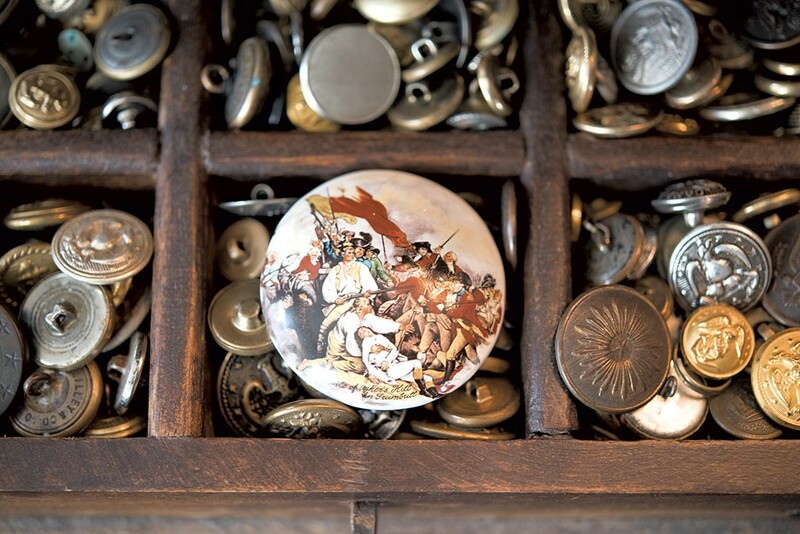 "The thing about button collecting is that you're a chronologist of history," declared Ed. He's a tall man who carries himself with the imposing, formal authority of a cop, which he was for 29 years. He speaks plainly and directly, probably as a result of his other career in news radio. Serious as they may be, the Larsons and their fellow club members aren't without a sense of humor about their admittedly niche pursuit. "People do tend to look at you like you're crazy when you tell them you're in a button club," Amy conceded with a chuckle. The Larsons have been collecting clothing buttons for decades; Ed specializes in relics from military and transportation uniforms, while Amy has a thing for ornate Victorian-era specimens. Each collection numbers in the thousands. When Seven Days visited the Larsons' cozy, cute-as-a-you-know-what Rutland home, both spouses marveled at the craftsmanship of their most prized items. Amy waxed rhapsodic over an elegant collection of jeweled buttons from the gay 1890s that she'd mounted to sheets of cardboard. Ed enthused about the fine artistry of copper and silver buttons from the 1700s — aka "the Golden Age of Buttons." For the Larsons and many other enthusiasts, however, button collecting is about more than aesthetics. It's about preserving the past, one tiny round piece at a time. "It's a documentation of history," said Amy. "Buttons document the trends and history of the time." "When you look at these buttons, somebody wore them," noted Ed. "All of these show the history of clothing, of design, manufacturing. When you save them, you're saving a piece of local or national history, or of family history." Amy works as an accounting assistant for Charles Coughlin, a Rutland businessman who owns several local McDonald's franchises. She got into button collecting after inheriting a sizeable collection from her grandmother, whose black-and-white childhood portrait she keeps in her living room. Inside the frame, she's affixed a string of small buttons that her grandmother wore. "Collecting buttons is a way to hang on to your family history that most people probably just throw away or keep in a jar," said Amy, whose midwestern twang betrays her Michigan roots. Verd Mont Button Club secretary Lisa Wernhoff agreed. Like Amy, the 64-year-old discovered button collecting through her grandmother's collection, which also included many of her great-grandmother's buttons. "They were very fancy," said Wernhoff of those specimens. "I've always loved anything that had to do with sewing," added the former University of Vermont home economics major. In addition to teaching home ec, Wernhoff worked as an archivist for Ben & Jerry's for 30 years. Nearing retirement, she decided she needed to do something with her family's buttons. "I realized I had to figure out what I had so that I could pass it on to the next generation," she said. She joined the button club five years ago and "just got sucked in." Like the Larsons, Wernhoff developed an interest in the history of buttons, particularly their Vermont history. At the club's meetings, members typically present on various research projects. Wernhoff, who is also a member of the 251 Club of Vermont and the Vermont Old Cemetery Association, said her first presentation focused on a button factory in Gaysville and on Middlebury-based Danforth Pewter. 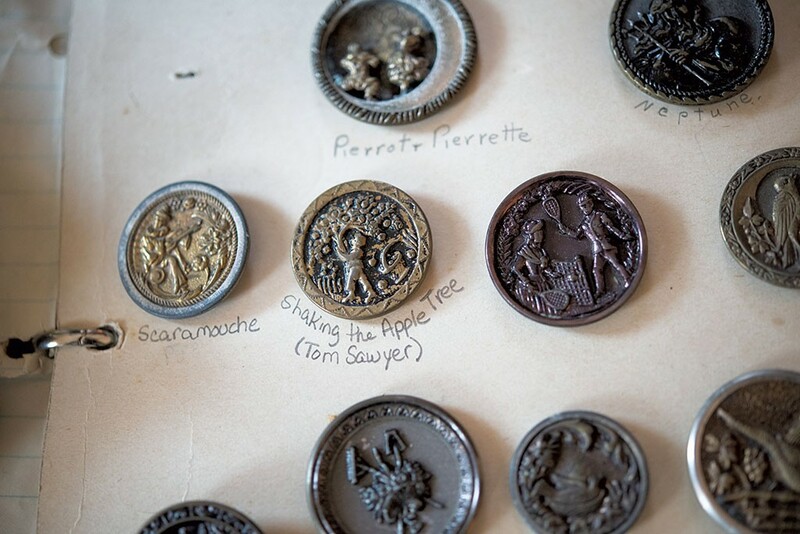 "I took it from the 1870s to the present," Wernhoff said of local button history. "I found it fascinating." Her fellow club members did, too. "She's really the authority when it comes to Vermont button history," said Ed admiringly. Verd Mont Button Club meets monthly, usually at various members' homes, from May to November, taking the winter off because of travel concerns. In addition to presentations, meetings include discussions on, well, hot-button topics, such as upcoming national and regional expos and competitions; VMBC is a member of both the National Button Society and the Northeast Regional Button Association. Members might help evaluate interesting or unusual button finds, typically with the aid of The Big Book of Buttons by Elizabeth Hughes and Marion Lester, which the Larsons refer to as "the Bible." There are also snacks. "We have some of the best cookie bakers in the country," opined Ed. While VMBC is composed mostly of older folks, Wernhoff described the membership as diverse, stressing their mix of genders, backgrounds and perspectives. As they might your shirt or jacket, buttons keep the group together, she said. "We've got everything from rabid Republicans to extreme liberals," explained Wernhoff, who lives with her wife in East Montpelier. "This group has brought them all together to share something we all love. We forget politics and religion when we're talking about buttons." Lately, club discussions have focused on the upcoming biannual expo in Shelburne, which will offer opportunities to meet collectors and view exhibitions. During Seven Days' visit with the Larsons, their living and dining rooms overflowed with displays destined for the expo, including Amy's Victorian buttons and Ed's military and transportation assemblages. Then there was Ed's blue-ribbon-winning "Ugly Button" display — his lone concession to the world of competitive buttoning. The framed display featured more than a dozen misshapen, busted and gaudily decorated buttons that only a grandmother could love. Each had a punny tagline: "Just Button Ugly," "Bolt Ugly," "Designer Disaster" and "Deserves a Shanking" — the last referring to a type of button called a shank. Also among the displays were tributes to recently deceased club members Barbara Wells and Warren Tice, the latter of whom the Larsons described as the authority on military buttons in the U.S.
"I've memorized all of his books," said Ed with palpable reverence. At the expo, Ed will present on a method he's developed for cleaning and restoring buttons that involves a solution of baking soda and Coca-Cola. While it's a unique and effective means of restoring corroded clasps, Ed's method has proved controversial in button circles. "The National Button Society does not approve," said Amy. "They have a fit about that," admitted Ed. "But you know what? It works." Besides divulging scandalous button-cleaning practices, members will help evaluate and identify buttons for expo attendees who want to know what kind of historical value those stray buttons kicking around in mason jars or junk drawers might have. The club will not, however, appraise buttons. "I won't tell you how much something is worth," said Ed. "You can go online for that." The Larsons are similarly cagey when it comes to the value of their own buttons. Ed said certain rare buttons can fetch upward of $10,000 to $15,000, adding that he doesn't own any that valuable. He did reveal that he's helped more than one curious collector identify buttons valued in the hundreds to thousands of dollars. Regardless of market value, in the Larsons' minds, their buttons are priceless. Ed, whose military button collection includes several worn by Vermont soldiers from as far back as the Revolutionary War, told a story to illustrate that point. Some years ago, when he was still a police officer, he visited a summer camp at the Vermont Police Academy in Pittsford run by the Vermont Army National Guard. There he met a guardsman who was about to deploy to Iraq. Ed happened to have brought along a uniform button worn by a Vermont cavalryman during the Civil War, which he gave to the guardsman. "I told him to take it with him and put it on his tunic or his jacket," recalled Ed. "But I told him it came with a caveat: If he took it, it meant he had to come back." The original print version of this article was headlined "Fasten Nation | Verd Mont Button Club celebrates 40 years"